Hi everyone! I’m Rachel Danae from the blog Not Rachael Ray. I write about easy and delicious recipes. I have a daughter and a slightly picky but extremely appreciative husband to feed every day. Oh, and I don’t really have anything against the superstar chef, in case you were wondering. I’m just not her. And you probably won’t catch me saying “yum-o.” EVOO? Maybe. I was so excited when Justin asked me to guest post because every time I get a package in the mail from Marx Foods, it feels like Christmas. I’m kinda in love with this company of his. On this specific occasion, I was provided with fennel pollen, dried chilies, coconut sugar, granulated candy cap mushrooms, and vanilla beans. I was given the challenge of creating a chocolate recipe with one or more of these quality ingredients. Then I panicked a little. I needed to do some research. I wanted to know as much as possible about each of the ingredients I had available for my use. Luckily for me, Marx Foods has some great resources on their website providing information about their products. Next, I put aside the coconut sugar and vanilla beans. I knew I was going to make a dessert and I wanted a real challenge. These were too “obvious” of dessert ingredients. Then I started cooking. Pudding. I’ve never made homemade pudding. I found a great recipe on Smitten Kitchen that involved no tempering of eggs. And she gave it rave reviews. I thought, I can do this! I knew I wanted to make three types, so I divided the recipe in thirds because I didn’t want 18 servings of pudding. 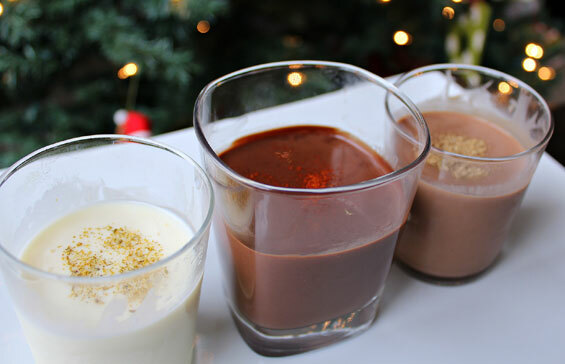 However, the recipes printed here for 6 servings of pudding, so if you decide to make all three, you may want to adjust the recipes accordingly. If you’re skeptical, give these a try anyway. 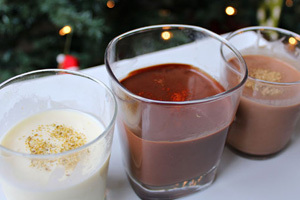 The flavors are all there but they work really well and give each pudding a special little twist. Candy cap mushrooms have a great maple flavor, and fennel pollen has a nice black licorice type flavor. If you’re still skeptical, the puddings can each be made without these special ingredients, but you’ll be missing out. Take my word on it! I think these would be great served in shot glasses on a small plate. My servings are a little bigger because I didn’t have 3 matching shot glasses. And because I’m a piggy. 1. In the top of a double boiler (I use a heatproof glass bowl over a large saucepan with a small amount of water in it), combine cornstarch, sugar and salt. Whisk in the milk slowly and use a rubber spatula to scrape the bottom and sides of the bowl. Add the lemon zest. Heat over simmering water, stirring occasionally and using a whisk if lumps form. (After I scraped down the sides, I usually used a whisk to take care of the lumps that would appear after scraping the bowl). Once the mixture starts to thicken and coat the back of the spoon (15-20 minutes), add in the white chocolate and continue to stir for 3-4 minutes until smooth and thick. 2. Remove from the heat and stir in the vanilla and fennel pollen. 3. Strain through a fine mesh strainer into serving bowls (or into a large measuring cup so you can pour more neatly). Note: I wanted the flavor of the fennel pollen and lemon to be infused and for the pudding to still be smooth. If you’d prefer a stronger flavor, stir in the lemon zest and the fennel pollen after straining the pudding. 4. 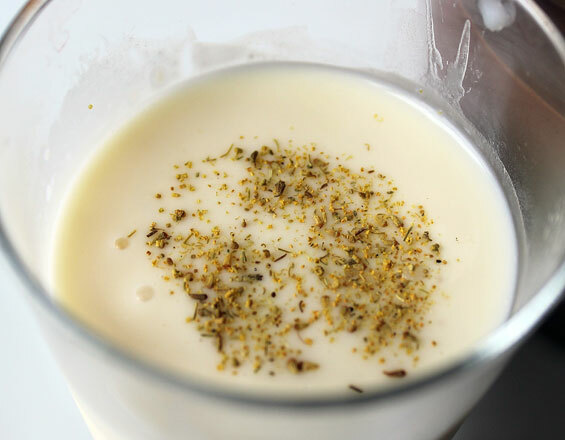 Place plastic wrap on the top of the pudding if you do not want “skin.” Refrigerate for at least 30 minutes and top with extra fennel pollen before serving. 1. In the top of a double boiler (I use a heatproof glass bowl over a large saucepan with a small amount of water in it), combine cornstarch, sugar, salt and ground candy cap mushrooms. Whisk in the milk slowly and use a rubber spatula to scrape the bottom and sides of the bowl. Heat over simmering water, stirring occasionally and using a whisk if lumps form. (After I scraped down the sides, I usually used a whisk to take care of the lumps that would appear after scraping the bowl). 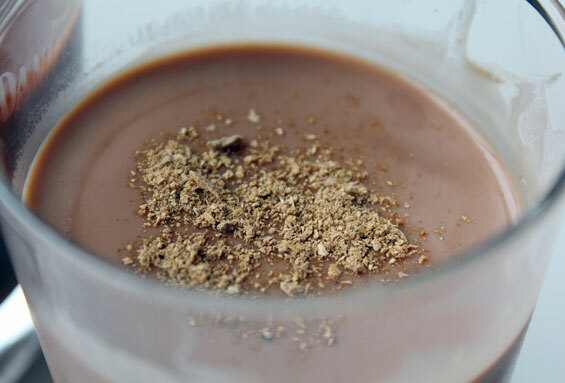 Once the mixture starts to thicken and coat the back of the spoon (15-20 minutes), add in the milk chocolate and continue to stir for 3-4 minutes until smooth and thick. 2. Remove from the heat and stir in the vanilla. 3. Strain through a fine mesh strainer into serving bowls (or into a large measuring cup so you can pour more neatly). Place plastic wrap on the top of the pudding if you do not want “skin.” Refrigerate for at least 30 minutes and top with extra ground candy cap mushrooms before serving. 1. In the top of a double boiler (I use a heatproof glass bowl over a large saucepan with a small amount of water in it), combine cornstarch, sugar and salt. Whisk in the milk slowly and use a rubber spatula to scrape the bottom and sides of the bowl. Add in chopped puya chile. Heat over simmering water, stirring occasionally and using a whisk if lumps form. (After I scraped down the sides, I usually used a whisk to take care of the lumps that would appear after scraping the bowl). 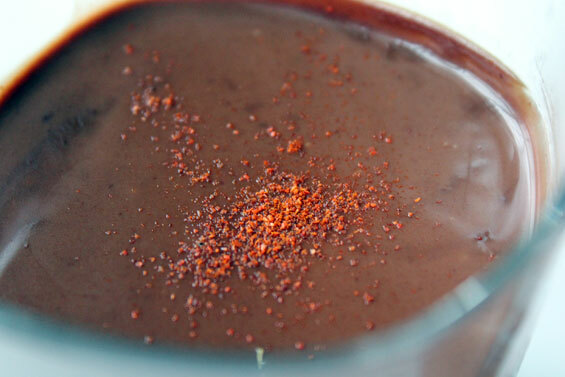 Once the mixture starts to thicken and coat the back of the spoon (15-20 minutes), add in the dark chocolate and continue to stir for 3-4 minutes until smooth and thick. Verdict: Yum, Yum, and Yum. Husband’s take: Only tried the dark chocolate variety–which I didn’t tell him included chile peppers (shh! ), but he loved it. The flavor is muted and just subtly adds a complexity and deepness to the pudding. Note: Later, I told my (non-adventurous when it comes to food) husband what each of the puddings had in them. His exact words? “Eww!” Then, the next thing that came out of his mouth, “It was so good, I could eat it every day.” Let me know if you can figure that one out. Difficulty: Lots of stirring and standing over a double boiler to make three types, but other than that, very easy! It’s great to have you here, Rachel! Sounds great! Let us know how it goes.